Jaksta's new converters offer the ability to convert large, high-quality video files and entire music libraries to all Apple devices and other popular formats. These converters use revolutionary new technology that offer super fast conversion speeds and optimal quality while still being simple to use. Jaksta Technologies Pty Ltd and Applian Technologies, Inc. are pleased to announce the release of two new specialized products to convert video and audio files on the Mac: Jaksta Video Converter and Jaksta Music Converter. Jaksta Video Converter for Mac is designed for transferring high quality video files (especially Torrent downloads and HD Camcorder AVCHD files) to devices like the iPad, iPhone or Apple TV. Thanks to its revolutionary “smart conversion technology,” Jaksta Video Converter offers the fastest possible conversion speed. While most converters process entire files (both audio and video), Jaksta Video Converter analyzes each file and only converts what is necessary for playing on the target device. Often a video file just needs “rewrapping” rather than full conversion to play on the desired player, so partially or completely “rewrapped” large video files can convert at original quality levels in only minutes rather than hours. Jaksta Video Converter takes almost any video format and converts for iPhone, iPad, iPod, AppleTV, Sony PlayStation3, Sony PS Vita, Smart TVs and more. For Music files, Jaksta Music Converter’s convenient interface converts entire albums or music libraries to popular audio file types playable on the iPad, iPod or iPhone. Jaksta Music Converter defaults to conversion at 320K AAC, the highest quality level supported by the iPod, iPhone and iPad. Additional preset functions make it easy to set up personal preferences for converting FLAC or WMA files, albums and libraries into popular formats at the highest possible quality. For more details on Jaksta Video Converter and Jaksta Music Converter, go to http://www.jaksta.com. 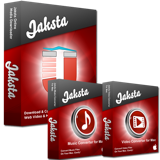 Jaksta Video Converter and Jaksta Music Converter are each available for $19.95, or customers can purchase both converters in Jaksta Deluxe for Mac for $59.95. All products require Mac OS X 10.6 (Snow Leopard) or later. Jaksta is a joint venture between Applian Technologies Inc. of San Anselmo, California and Jaksta Technologies Pty Ltd of Perth, Australia.